I am really bummed not being able to get baby girl's room put together. We still have a few months until we are in the house and I feel like I am going to be super rushed. I don't know if this is nesting SUPER early, or just my normal anxiety with the house. With Eliza, I started her room right away. Back then, Pinterest sure wasn't what it is today. Luckily, I have been able to store all of my ideas so hopefully I will get rolling as soon as we get in the house! We are going to be using Eliza's old furniture now that we have decided to move her into a full bedroom set. We even found one on Craigslist for a GREAT deal. It isn't exactly what I was looking for but for the girls to have and pass down over the next 10 years it will be perfect! Here is the bedding I ordered. 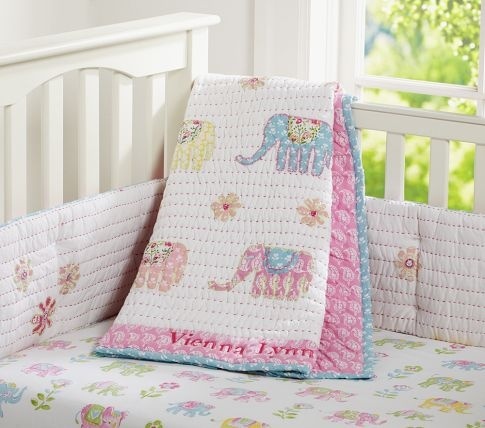 I have LOVED elephants all of my life, when I saw this bedding a few years ago at Pottery Barn I was so bummed I already had Eliza's crib bedding. Luckily, I found a set on Ebay for this nursery!! SCORE! It only came with the sheets and bumper so I want to make a pink ruffle skirt to match it. Let's hope my sewing skills are up to the challenge! 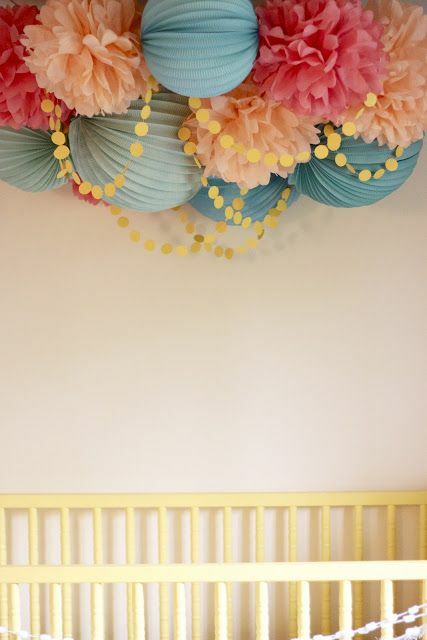 I would love to decorate the ceiling above the crib. I was never one for mobiles but something to attract her eyes would be pretty. How cute is this rug? I picture a big one but the tutorial said it is super time consuming, so maybe just a small one in front of her crib or changing table. 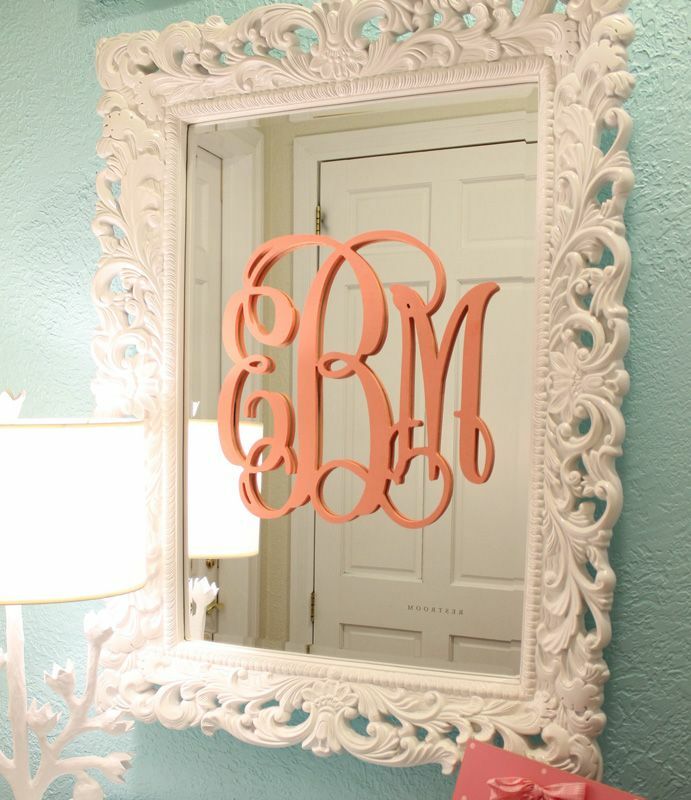 I would love to have her monogram up in the room somewhere. I love how this is on the mirror. Might just frame it though. I really want to add a growth chart to both girls rooms. I love this one for hers, so sweet!! Her room is probably going to be pink. I have to be honest, I am super sick of pink because of Eliza's room. Hopefully if I lighten it up enough, it won't bother me as much. I love this pink from Benjamin Moore. I am hopeful our house will keep chugging right along so I can get in there and get the girls rooms done. Having to redo two rooms is a bit overwhelming! You can find all of the original posters, or stores, these photos came from over on my Pinterest page.